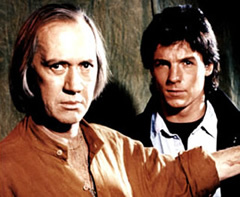 In this spin-off of Kung Fu, Shaolin priest Kwai Chang Caine (David Carridine) presides over a temple in Northern California where he lives alone with his young son, Peter (Chris Potter). The temple is destroyed by a fire that was started by one of Caine’s enemies who wanted to seize it. Father and son are lied to and believe that each other has been killed in the blaze. Caine travels away from California while Peter grows up in an orphanage and later studies to be a police officer. Fifteen years later, Kung Fu master Caine arrives in Chinatown to assist with a case, the same one his detective son Peter has been assigned to. The two joyfully reunite and Caine then aids Peter on the various cases he’s given. But, as Caine regains his footing as a father, he learns that his son has different values than the teachings of the Shaolin. While Caine abhors violence, his son deems it a necessity to his job. As the two spend more time together, Peter begins to become attune to the wisdom of his father. The series also features Peter’s boss, Lieutenant Paul Blaisdell (Robert Lansing), chief detective Frank Strenlich (William Dunlop), and Tyler Smith (Marla Schaffel), who shares a rocky relationship with Peter. I agree with the fan above that the whole series be available on DVD to play for own pleasure as many times as desired. I liked that story a lot..Or let it run again on American TV. Actually, it has been released on a “press by order basis” on the WBStore website. Official Warner Brothers release and not a bootleg. Is a bit pricey ($49 plus tax and freight), but a lot less than the $198 for the German version. Right now, only the first season is available; but if they get a lot of orders, I am certain they will release the other reasons on the same basis. This product right now is only available in the USA. Canada apparently is not included. My Germany version in English restricts number of times it will play. @hi: Sorry, it hasn’t been released on DVD yet. Does anyone know if there is any place that has the series for sale on dvd or vhs?